The final version of Windows 7 was released yesterday for MS Technet subscribers, but you can’t upgrade directly from a pre-release version—at least, not without a quick and easy workaround, and we’ve got you covered. 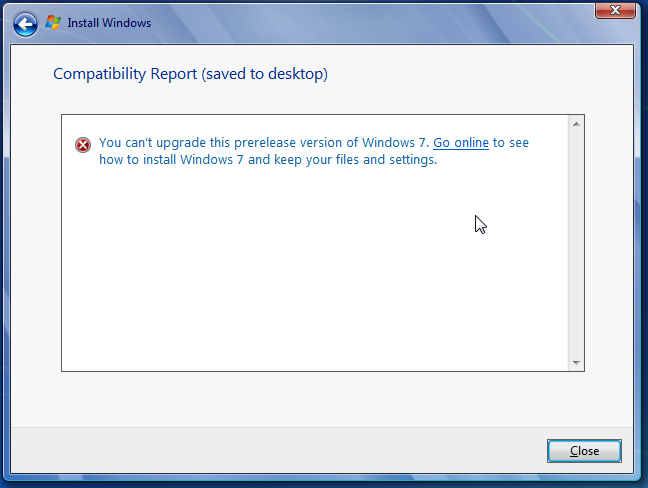 Windows 7 checks whether or not the current version you are running is a pre-release copy, and prevents you from upgrading further. For reference purposes, this is the error you’ll see when you try and upgrade. The solution is to edit a file inside the Windows 7 DVD—which you’ll have to extract to the hard drive to proceed. If you are using an ISO image for the installation progress, you can use the awesome 7-Zip utility to extract the ISO to a folder on the drive. If you are using an actual DVD, you can simply copy all of the files from the DVD to a folder on your hard drive.